West, Texas (MarkHeidemanTV/CNN) -- Two people are dead following a massive fertilizer plant explosion in the small town of West, Texas. The explosion happened late Wednesday evening. Leveled homes and businesses are the result of this tragedy. Dozens of residents are being treated medically. Stay with MarkHeidemanTV for the latest on this devastating situation. *The stabber is a 21-year-old student from Lone Star College. *2 people are currently in critical condition. *2 people are refusing medical care. Harris County, Texas (MarkHeidemanTV/CNN/CBS) -- A stabbing spree took place at Lone Star College in Harris County, Texas during afternoon classes in the health sciences building on Tuesday. According to CNN, police and emergency officials responded to the scene very quickly. Four people were lifted to the hospital by helicopter. CBS reports that one person has been arrested in connection with the stabbings. It is unknown if the stabber is a student. The motive of this stabbing is also unknown. Stay with MarkHeidemanTV for the latest information on this story. Harris County, Texas (MarkHeidemanTV/CNN) -- A stabbing spree took place at Lone Star College in Harris County, Texas during afternoon classes in the health sciences building on Tuesday. It is unknown if the stabber is a student. 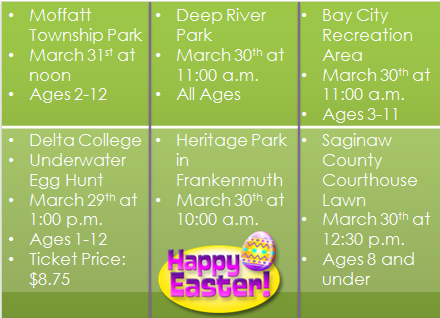 Easter is just around the corner, and several Mid-Michigan Easter egg hunts will be taking place to celebrate the holiday. MarkHeidemanTV has a complete guide to popular egg hunts below. (MarkHeidemanTV) -- The numbers for the sixth-highest Powerball jackpot have been drawn, and the winning ticket is waiting to be turned in. The jackpot amount is estimated to about 320 million dollars. The winning numbers are 17 29 31 52 53. The Powerball is 31. Details regarding the ticket are extremely limited at this time. Stay with MarkHeidemanTV in the days ahead as this Powerball win continues to unravel. In the midst of this draw, we want to know what you would do if you won this money. Visit our Facebook page to leave your comments! Bay City (MarkHeidemanTV/MLIVE) -- March 1st kicked off the beginning of reading month across the nation, and Bay County Public Schools started with a bam. In an attempt to break a world reading record, students spent their half-day reading and taking Accelerated Reader tests. 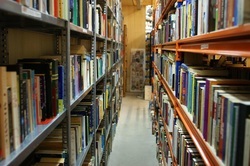 Accelerated Reader is a program that helps children find and raise their reading level. The current reading record is 3,581,992 Accelerated Reader tests taken in one day. According to Mlive, students were invited to wear their pajamas to school and read as much as they can. No word yet on if they broke the record. Saginaw (MarkHeidemanTV/WNEM) -- A half-foot water main break was the cause of a water shut-off in a portion of Saginaw, Sunday evening. WNEM reports that residents along Malzahn Road were affected by the shut-off. Residents received their water back at 7 p.m. The freeze-thaw trend was said to cause the break.